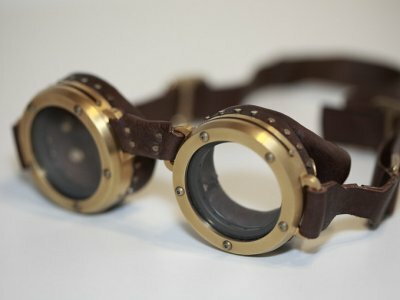 I don't know what I like about them, but every now and then, I see a set of goggles that somebody made, and I just can't stop staring. Here's a set of WW2-era aviator goggles. 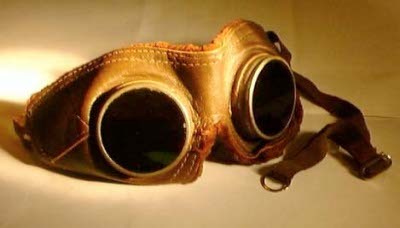 And here's a set of titanium aviator goggles that inspire me to build a time-machine. Kristen - ha! It might be a matter of collecting, as opposed to wearing, so I dunno that I would call it a *fashion* obsession. There aren't a lot of occassions that aviator goggles are appropriate to wear, you know? I know how you feel! x) I LOVE love goggles too! x) They are so awesome! I wonder where I can buy some...? I'm sure you have gotten a lot of feedback on those beautiful goggles. I am a fashion photographer and we are working on the styling for a photo shoot that will appear in the premiere issue of Bayfront Magazine. Miami/Naples Florida publication. I am doing the shoot at the lab in the Edison Ford summer estate. ... and finally my question. Would you be willing to loan your goggles to us for the shoot. We would give you credit in the Magazine as well as the image we use. Of course we would treat them with great care and return them to you directly after the shoot. Those aren't my goggles. They're on the websites that I linked to. dude I really want some of those goggles to go snowboardin with but with tinted glass I think it would be so awesome do you know how much they would cost???? For those of you wondering where to buy them, or how much they cost, I have some disappointing news for you.